Many websites these days have a ‘sticky’ or always visible top menu bar – that is present no matter how far down the page you scroll. 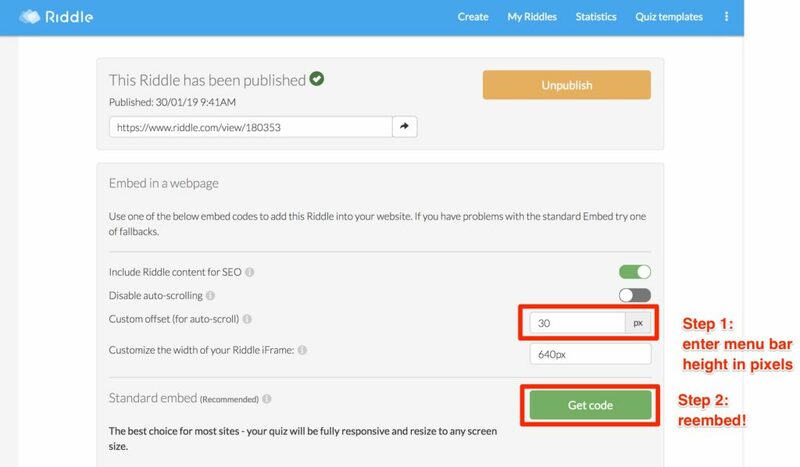 This can cause issues with embedding a quiz – because your site’s header bar will overlap the quiz, and your audience will have to scroll down after each questions. But fear not – there’s an easy fix. We added a ‘custom offset’ feature for just this situation. Simply enter the height of your site’s menu bar in pixels – and your quiz will be pushed down that amount, so it will always appear below it.